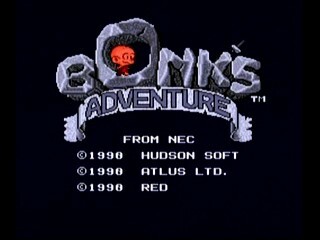 Bonk's Adventure is a classic platformer that was a defining game of the TurboGrafx-16, released in 1990. It stars a little caveboy called Bonk who sports a gigantic forehead, which he uses to bonk enemies in the name of rescuing Princess Za. Due to this obvious charm, Bonk served as NEC's de facto mascot. Bonk's Adventure was followed up by Bonk's Revenge and Bonk's Big Adventure, but no Bonk's Big Revenge. Best time: 0:29:45 by Jeremy 'DK28' Doll on 2014-03-10. Ten times out of ten, SDA Staff rocks 100% of the time! This is another run that is close to my heart. Outpouring of childhood nostalgia is intense here. This run should have been done long ago, it is sorely missing from the SDA Game List. I had this and The Legendary Axe on my plate for the TG16. I opted for The Legendary Axe funnily enough, as that is a brutal game, see The Pits of Madness for reference... I'm so happy to be finally submitting this run. There was a previous submission a few years ago that was rejected. It had some good strats and well executed Boss fights, but the level play was sub par and that is critical in this game as it is not made to be fast. I would like to also thank Mrs Kong for continuing to support this speed running stuff. Enduring all the late nights, controller throwing, yelling and also humming the level music for me. XO. To Blechy, always in my stream keeping me motivated and bringing that good RNG. And to Mr. K, who adores this game as much as I do. The man who got my stream running and figured out Stage 5-2. And to zallard1, you figured out Gladdis, enough said. You two are good friends in real IRL, thank you for everything. The Audio Commentary also covers a lot of details. HUEY - Damage boost to get up high. Timing is critical to keep the repeated Head Butts. Round 2 - Here you'll see where I begin using two meats for the speed boost. When doing this, you have to maximize the opportunity as you waste about 5 seconds for animation for each meat eaten. Just walking isn't enough. You must take flight and stay in the air to continue the speed boost and really get your time out of it. 2-4 is one of the worst stages in the game. I stutter on the Purple Hatchet to do a jump bonk. It is more powerful than a standing bonk, so I kill him in one hit and get the meat. The rest is very heavily execution based. You'll notice I get hit back in the air, but keep going right, because when you recover, you'll still have your increased speed since I haven't touched the floor. Going through the tree tops, I get the last big meat as it doubles your attack power and helps with the Gladdis fight. GLADDIS - Again, zallard figured out this fight, there's still RNG for her teleports in the second phase, but this fight was cake once figured out. Round 3 - Here you see one of the more elaborate routes for meat. I get hit by a duck, but continue through the air and bounce back up. You'll see I grab the wall. Since I don't touch the ground, I can still keep my momentum till the end of stage. Then on to 'Blechy Bridge'. I dubbed it that, because it's a leap of faith and 50/50 if I will stick the landing. I always made it when Blechy was watching, unfortunately he wasn't there this night... Sliding on the ice angles is a bit fast and I get a lucky cube drop that I can ride as well. KONGO ZILLA - I retain level 1 meat for a couple hits. Just one mistake landing on him feet first. The rest of the fight was pretty good. Round 4 - The shortest and most brutal round. Job one, fly with the meat boost. Job two, navigate the vulture swarm. Job three, boost off the only flower pod and get lucky volcano rocks to bounce off. Job four, get the Perfect Pedro fight. All that is ridiculous and harder than it looks. Round 5 - Final stage. This was the best 5-1, I get up and out quick. Mr K helped me figure out the start of 5-2, ensuring a 100% spawning of the purple hatchet to get the big meat boost. It's critical as that stage is complicated. I get the water level skip first try. The T-Rex room, goes insanely well. Followed by the Bubble room, which goes in incredibly well. Followed by the Shower room, which is unbelievable. Then the climb of 5-4. I execute like crazy, the game tries to get me with the vulture and T Rex, but I won't be denied. Ending with the pixel perfect meat avoidance. At this point, Round 5 has been great, for all of that to go so well is beyond good. The waterfall, it is faster to let the Crocket Dile take a quick bite. KING DROOL - Shadow phase goes one extra round, but not too bad. Then phase 2 is Godly. Enough said.